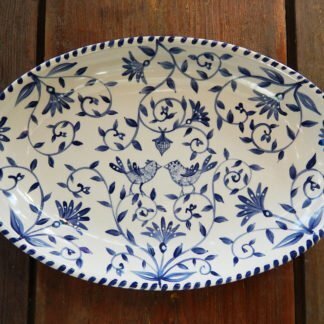 This platter is a fabulous size; about 14″ x 9″, lovely as a display piece or to serve food upon. It is made in white stoneware ceramic, hand painted in cobalt and french blue underglazes. 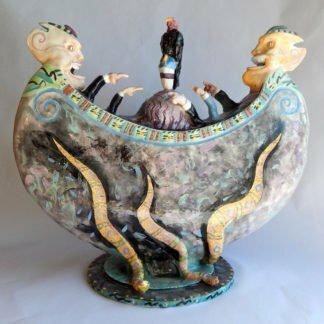 You may request a custom greeting or dedication on the bottom. 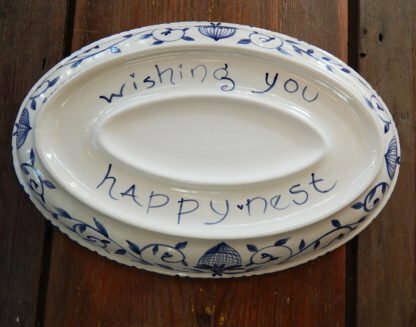 Our hand painted ceramic Delft Blue birds “Happy.nest” Platter maybe personalized for an heirloom gift they will treasure always. This platter is a fabulous size; about 14″ x 9.” It is lovely as a display piece or to serve food upon. 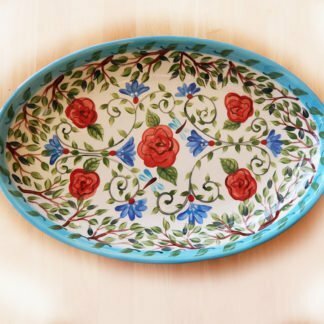 Platters are made in Italy, of high quality white stoneware ceramic, which I hand painted in cobalt and french blue underglazes. The floral design surrounds two birds facing one another (each on one goblet)signifying a happy marriage. The acorn signifies a love that grows stronger with time. You may request a custom greeting or dedication on the bottom. 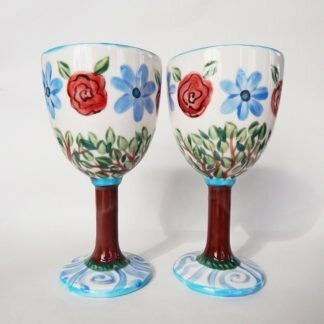 I usually put the first names of the bride and groom and their wedding date for wedding or anniversary gifts. 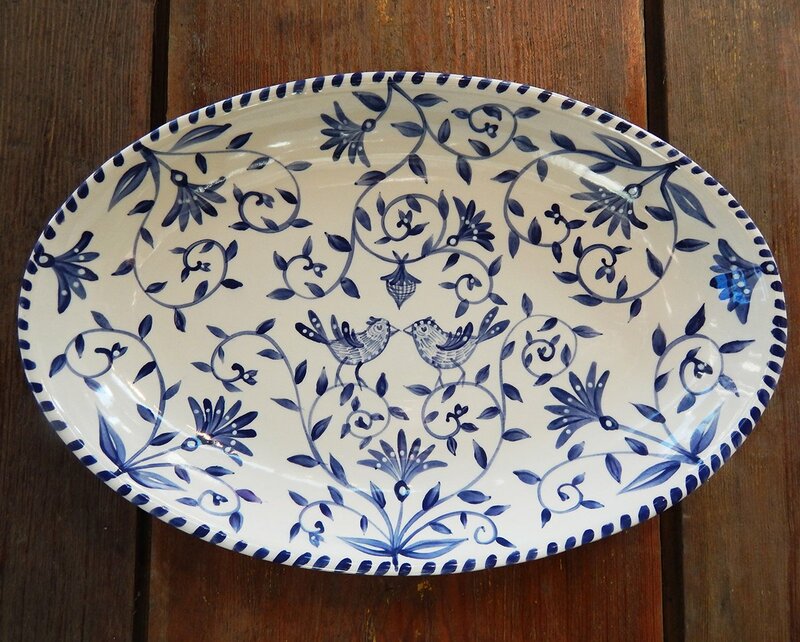 Our platters may also be easily hung on the wall with a plate hanger. 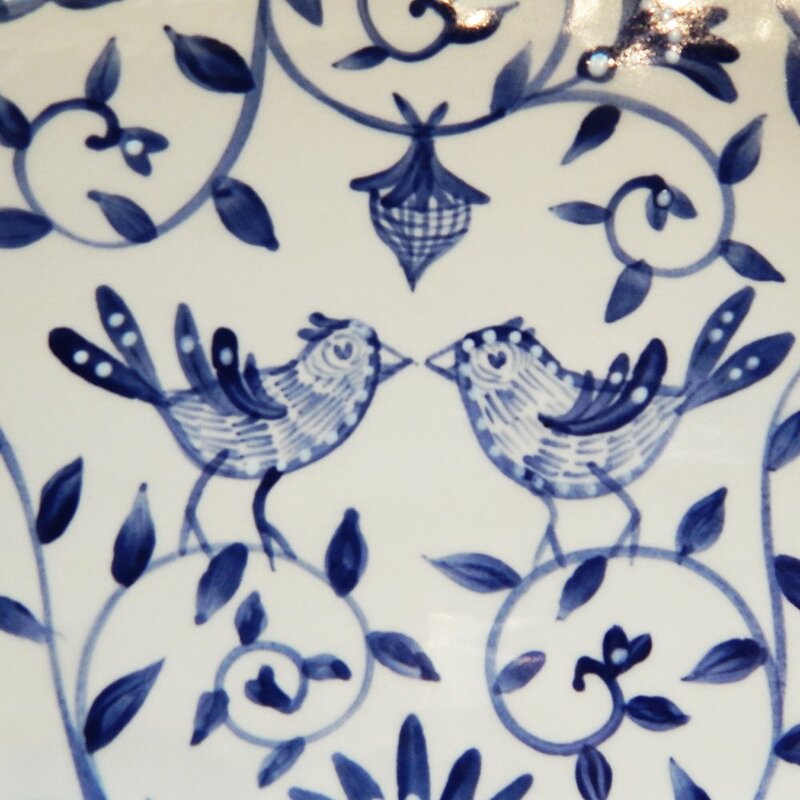 The Delft blue pattern is a favorite reminiscent of traditional Blueware but fitting in modern decor with it’s clean whimsy. The Delft Blue birds “Happy.nest” Platter is a treasured gift for newly-weds, anniversaries, house-warming gift or simply to add a lovely piece to a loved-one’s tabletop collection. 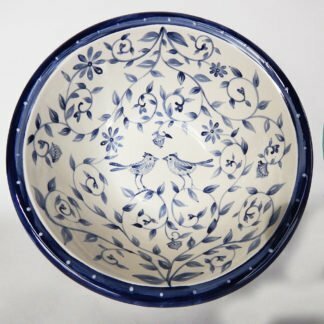 The popularity of my happy.nest bowl, goblets and further requests for matching items inspired the addition of the platter- now a favorite. 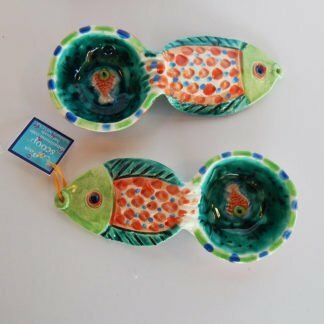 This gives a few relatives of the bride and groom the opportunity to contribute to what will be an heirloom set for the new family or much appreciated additions for years to come. 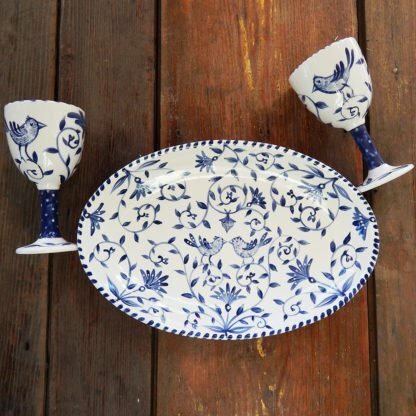 All dinnerware is food safe.